miners left material in the wet duster, after a day or two, it became plugged. The DSI polymer technology — the air bubbles and the foam composition mass, according to Pinkley, eliminates those concerns. DSI is currently marketing three DYWIDuster models. The 160-gallon unit typically fits into one side of the scoop and was designed for a mid-coal application. They also have a 250-gallon applicator that is more suited to low-profile work, fitting all of the way across the scoop bucket. They also have a 500-gallon unit that is more suited to mid- to high-seam applications. "By having multiple multigallon units, we can match the system with the company's mining cycle," Pinkley said. As far as maintenance, Linn explained that miners simply hose the tank out and spray some of the water through the applicator. "They can even leave some water in the tank and it will be ready for the next day. Anywhere that we have performed demos under- ground, the operators all seem to like the process and the machine," Linn said. "It's easy to use. The miners feel that this system puts more dust on the roof than any other system. They see dry dust fall all of the time." The polymer does two things, he explained, it helps dissipate the water and it also helps it stick to the roof and ribs. In February, mine operators will be required to use continu- ous personal dust monitors (CPDMs) to sample for respirable coal mine dust on working sections of underground coal mines. 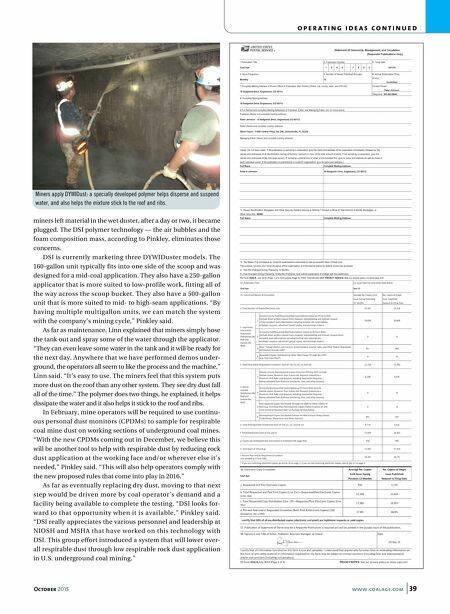 "With the new CPDMs coming out in December, we believe this will be another tool to help with respirable dust by reducing rock dust application at the working face and/or wherever else it's needed," Pinkley said. "This will also help operators comply with the new proposed rules that come into play in 2016." As far as eventually replacing dry dust, moving to that next step would be driven more by coal operator's demand and a facility being available to complete the testing. "DSI looks for- ward to that opportunity when it is available," Pinkley said. "DSI really appreciates the various personnel and leadership at NIOSH and MSHA that have worked on this technology with DSI. 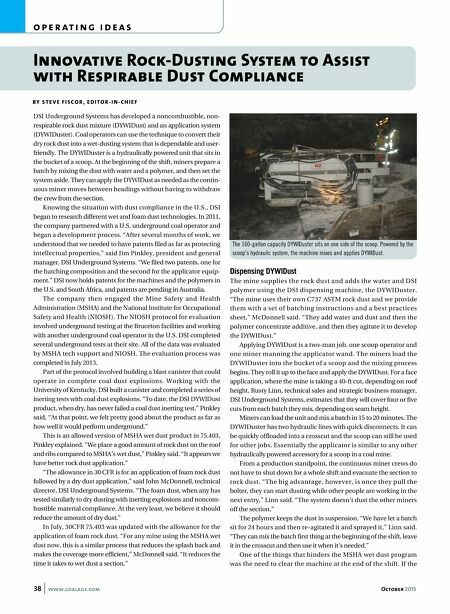 This group effort introduced a system that will lower over- all respirable dust through low respirable rock dust application in U.S. underground coal mining." o p e r a t i n g i d e a s c o n t i n u e d October 2015 www.coalage.com 39 Miners apply DYWIDust: a specially developed polymer helps disperse and suspend water, and also helps the mixture stick to the roof and ribs.